Fifty years have passed since the year 1968, and there have been plenty of retrospectives about the events from that tumultuous year. A book was written about the Tet Offensive and a commemoration took place in Memphis on April 4 – the day 50 years ago when the Rev. Martin Luther King was assassinated. 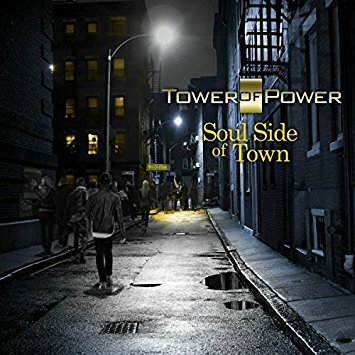 In the world of music, Tower of Power is now releasing their new album, Soul Side of Town, and the band celebrates the 50thanniversary of their founding on June 1. TOP’s anniversary, which will also include a concert, will be not be a silver anniversary in name only. Four of the founding members, Emilio Castillo, Dave Girabaldi, Stephen Kupka and Francis Prestia, remain with the band. Secondly, unlike many of their contemporaries from days with R&B giant bands ruled the earth, TOP never stopped working. They simply inserted a vocalist and kept it pushing. The Oakland based unit stood, ready, willing and able to do a live show in good times and bad, regardless of whether TOP had a record deal or a new album to promote. It wasn’t always easy. Group members indulged in many of the excesses common among rock and R&B groups in the 1960s and 70s. As recently as last year, the band almost lost Girabaldi when the drummer and bassist Marc VanWageningen were struck by a train while walking near a concert venue. Fortunately, the two men recovered, and will be here to celebrate the silver anniversary and Soul Side of Town, a fun and well-balanced collection of instrumentals, ballads, funky up-tempo tunes and bluesy mid-tempo numbers. The lead vocalist has an honored spot in TOP history. It has been held by men such as Rick Stevens and Lenny Williams, who sealed their legends with their work on “You’re Still a Young Man” and “So Very Hard To Go” respectively. Uber-talented lead singer Marcus Scott shines on Soul Side of Town’s three ballads, and especially on “Let It Go,” a lush brassy track on which the baritone bringing vulnerability and pathos while trying to explain why the perfect woman is not perfect for him. “Do You Like That” is a joyous number that features the trademark horns and a thick and bouncy bass line that is a celebration of taking your lady out for a night on the town, while the funky and blues of the title track is an homage to those clubs with a reputation for a great atmosphere and even better music. “Butter Fried” is an instrumental that allows the band to flex its funk, blues and jazz chops, as it features solos on the electric organ, and call and response between sax and horn that draws its inspiration from the big band era. TOPs anniversary concerts will also serve as reunion as alumni such as keyboard player Chester Thompson and saxophonist and leader of the Saturday Night Live band Lenny Pickett will make a return. Who knows, Lenny Williams might even show up, and while long-time fans will want to hear all those TOPs classics, the hot new tracks from Soul Side of Town will fit in nicely. Highly Recommended.